The A-Hoy is 1.0 MB. Larger files take longer to load. This is the A-Hoy listing page, here you can download the plan, article and see the main thumbnail and extra images. I wanted a reasonably large aircraft, powered by a .61 engine, and with good wing area. I wanted it to be acrobatic to fly, allowing the pilot to do something more than just shoot touch and goes. I wanted it to be rugged to take the banging around that happens on the rocks and broken obstacles found along most lake shores. I wanted it to be easy to build and maintain and, above all, I wanted it to be fun to fly. The A-Hoy does all of the above. 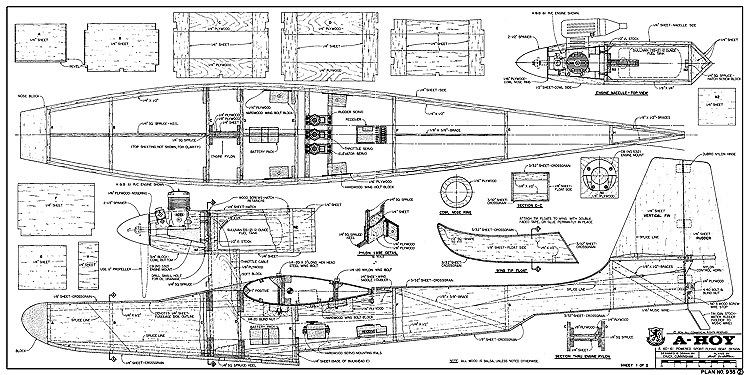 When I set about designing the A-Hoy I used the basic premise that the hull would be simply a large float. The design on the hull would be exactly the same as the foam floats that I had been using for a couple of years. I looked back through past issues of RCM and other magazines to see what other flying boats looked liked and how they were set up, and found that everyone else had used about the same idea. 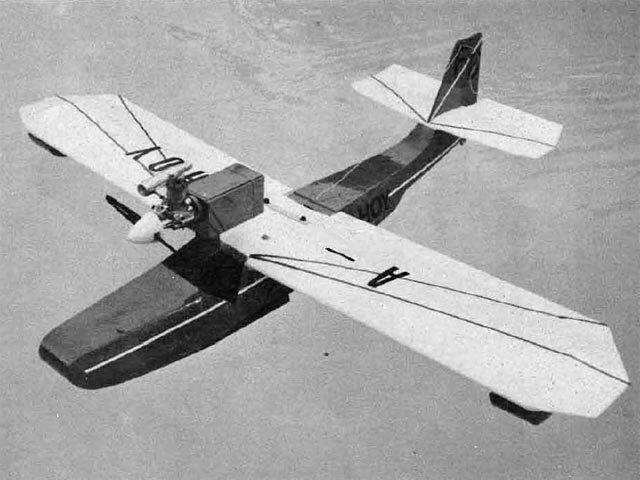 The finished A-Hoy looks very much like several of Ken Willard's designs, and well it should, because Ken is really the Grand Daddy of flying boat model designs. A-Hoy is very rugged and is built to take hard knocks. Because most of the lake shores are less than clean, and because hidden hazards are always around, I recommend that you cover the bottom of the hull and the sides with lightweight fiberglass cloth and resin. A-Hoy was designed to fly on a .61, but after flying her for a season, I feel that if you wanted, you could do well with a .40. Naturally, the take-off run would be longer, but at an all-up weight of only 6 to 6.5 Ibs. (mine weighs in at 6Vz Ibs. and a wing area of 800 square inches) it can easily be flown with a lot less power than the Speed Webra puts out. These are the details for the "A-Hoy" plan. If you would like to become a plan editor and help us to edit the attributes of all the plans in the website please click the "Edit Attributes" button below. 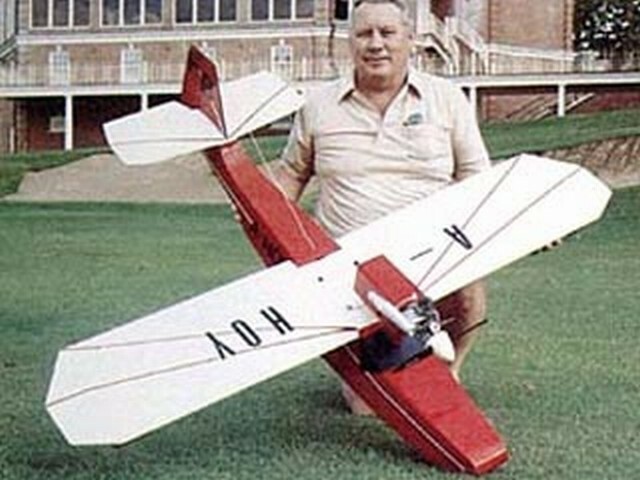 Keywords: Flyingboat glow engine wood balsa construction four channels R/C cabin. Order your A-Hoy prints today! The A-Hoy plan can be printed on plain paper, tracing paper or polyester film and shipped worldwide. This tool allows you to calculate the cost of printing and shipping the A-Hoy plans and its building article if available. If you need to resize a plan please contact us with the ID:97707 and the desired wingspan. I will calculate a price upon request, please contact me here mentioning this PlanID: 97707 and the job you wish me to do.